Vine-ripened tomatoes, extra virgin olive oil, sweet basil, mozzarella and fontina cheeses, and tomato sauce on a crispy thin crust. New improved recipe. No artificial flavors. Preservative-free crust. 320 calories, 7 g sat fat (35% DV), 480 mg sodium (20% DV), 4 g sugars, 12 g protein (15% DV), 15% DV calcium per 1/3 pizza. Try these other exciting flavors: Fire Roasted Vegetables, White, Sicilian Recipe, BBQ Recipe Chicken. Take your taste buds on an adventure! Taste the adventurous spirit of California-style cuisine in every bite of California Pizza Kitchen pizza. Our unique flavor combinations are sure to invigorate your taste buds. For our Margherita pizza, we top our crispy thin crust with vine-ripened tomatoes, extra virgin olive oil, sweet basil, mozzarella and fontina cheeses, and tomato sauce - all on top of a new, crispier crust! 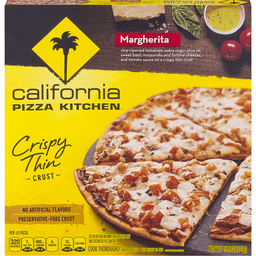 And the only thing that makes a slice of California Pizza Kitchen pizza even more delicious is pairing it with a fresh salad inspired by the California Pizza Kitchen restaurant menu, which also creates an especially flavorful and well-balanced meal. We've included salad recipes that you can make at home that pair perfectly with each one of our ready-to-bake pizza varieties. Visit our website at www.cpkfrozen.com for more salad recipes and other helpful information about our pizzas and salad pairings. Enjoy! For a tasty and adventurous dining experience, go to www.cpk.com/locations for a California Pizza Kitchen restaurant near you. Please recycle this carton. Visit www.cpkfrozen.com or www.nestleusa.com. 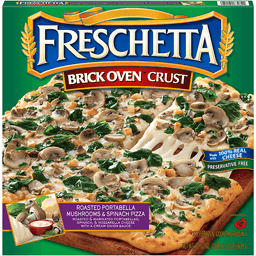 Freschetta® Brick Oven™ Crust Roasted Mushroom & Spinach Pizza. Made with 100% real cheese. Preservative free. Mozzarella cheese, roasted white and baby portabella mushrooms, and spinach with a cream onion sauce. Net wt 22.52 oz (1 lb 6.52 oz) 638g. Crave the crust: We crafted a fire-baked, square-cut crust inspired by the legendary brick ovens of Italy. Freschetta Brick Oven® pizza has a crust that's superbly crispy on the outside and delicately tender on the inside. Then we load it edge-to-edge with sauce made from real tomatoes, premium meats and real cheeses. The result is pure pizza perfection with the fire-baked crust you crave. 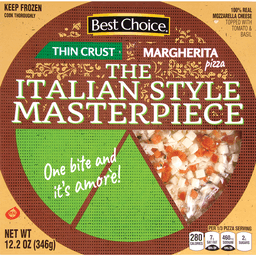 More Freschetta® pizzas your family will love: Artisan crust: A delicious crust made with a blend of 3 whole grains. Rising crust: A preservative free crust that rises like fresh baked bread. Gluten free crust: A great tasting pizza that happens to be gluten free. 100% recyclable. Recycling programs for this package may not exist in your area. Questions or comments Please contact us at: 1-866-FRESCHETTA (373-7243). Visit our web site at: www.freschetta.com. ©2016. Spinach, mushrooms & a four cheese blend with a creamy alfredo sauce. Fresh baked taste. Per Serving: 350 calories; 3.5 g sat fat (18% DV); 420 mg sodium (18% DV); 5 g sugars; 17 g protein (26% DV); calcium (25% DV). PointsPlus 9: The PointsPlus value for this product was calculated by Nestle USA, Inc. and is provided for informational purposes only. This is not an endorsement, sponsorship or approval of this product or its manufacturer by Weight Watchers International, Inc., the owner of the Weight Watchers and PointsPlus trademarks. Good food, good life. 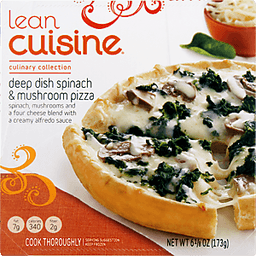 Good Question: How does Lean Cuisine make delicious so nutritious? Good to Know: Dishes you can accessorize. This delicious dish is 350 calories, so you can add some extras to maintain a healthy lifestyle. Good to Remember: Need some edible inspiration? Go to meals.com/balance for simple tips on ways to complement your entree with fruits, vegetables and dairy. Good to Talk: LeanCuisine.com or Nestleusa.com. 1-800-993-8625. Nutritional Compass. Made with organic shiitake mushrooms, red onions & fire roasted red peppers. Certified vegan. Vegan-org. Dairy free. Family owned since 1987. No GMOs: Genetically engineered ingredients. After the birth of our daughter Amy in 1987 we found there was little time to prepare the quality homemade food we normally ate. Realizing there were other like ourselves, we set up Amy's Kitchen to prepare delicious meals for those who care about the food they eat but are often too busy to cook. We use only the finest ingredients and prepare them with the same careful attention in our kitchen as you would in your home. 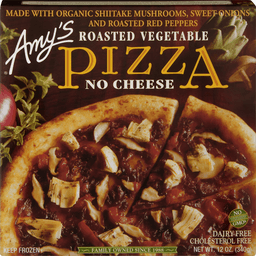 No meat, fish, shellfish, poultry, eggs or peanuts are ever used in any Amy's products. Looking for a truly special pizza? Look no further. The hand-stretched, tender crust is made from organic onions, shiitake mushrooms, red bell peppers and marinated artichoke hearts. It is fully baked allowing the flavor to soak into the crust for a delicious treat. Try cutting it into appetizer size pieces for your next party, and it will remind you of the finest focaccia. Irresistible! Everyone in our family loves pizza: for dinner, lunch, snacks, parties - even for breakfast. And everyone has a favorite. Amy and her friends like their pizzas with just cheese & sauce, and so did her grandma Clarice. Her dad goes for a spinach topping. Her mom & grandma Nonny prefer cheeseless pizza with lots of veggies. So we decided to offer a variety of toppings. One thing everyone agreed on was that the crust had to be excellent. Not hard, soggy, or thin like cardboard. So we created a crust that is light, tender and tasty. The dough is made from organic flour with a touch of olive oil to give it flavor and tenderness. Then it's hand-stretched, baked and after that, we carefully add the toppings in perfect proportion to the crust. No GMOs. No genetically ingredients. We like hearing from you. If you have any questions or comments, please write to us. Find out more about our products, our company, our family and what makes Amy's food so special at www.amys.com. Quality Assurance International: Certified organic. Carton is recyclable. Please recycle where facilities exist. Made in USA. 4 veggie patties. 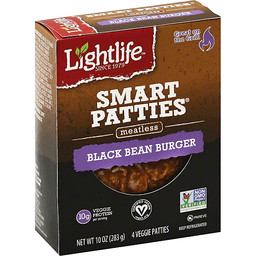 10 g veggie protein per serving. Great on the grill. Certified vegan. vegan.org. Non GMO Project verified. nongmoproject.org. Since 1979. Our Story: We began in Western Massachusetts in 1979 with a passion for creating great tasting vegetarian food. Over the years, we have grown by sticking to our roots - quality and care in everything we make, and giving 5% of our profits back to organizations that support a healthier you and a healthier planet. Today, our mission is to make eating better accessible and deliciously easy, because the more people love our food, the more good we can do together. Come join us on the journey. Facebook. Twitter. Instagram. Pinterest. Visit us at lightlife.com & check us out on social media! Healthy Tips: Many plant protein sources, including soy, legumes and quinoa, are complete proteins, which mean they contain all nine essential amino acids. There's no difference between these protein sources and animal protein! No added nitrates. Great recipes and more at lightlife.com. Toll-free, M-F, 9-5 EST 1-800-769-3279. 100% recyclable carton. Giving back 5% since 1979. Giving back to the community has been a priority since the very beginning. For over 35 years we have contributed 5% of our profits to organizations that support the earth on which we live and healthy lifestyles for people like you. Come join us on the journey. Visit us at lightlife.com.